The GB Pockit+ Stroller is a compact, two-step fold that robotically locks and can stand independently, making it great for commute and storage. The GB Pockit+ Stroller is a compact, two-step fold that robotically locks and can stand independently, making it great for commute and storage. 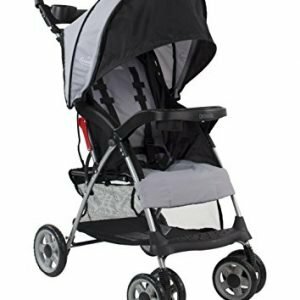 This stroller also features an adjustable backrest in addition to a generous sun canopy, plus a spacious under-seat basket that may hold as much as 11 pounds. Features: Commute system able with included adapters for Cybex infant car seats Suitable to be used from birth (if used with a car seat) as much as 55 pounds Compact 2-step fold robotically locks and can stand independently 1-hand push for convenient pushing and steering Adjustable harness system Comfortable, adjustable seat back for sitting up or reclining UPF 50+ sun canopy Removable, washable seat fabric Swivel front wheels can also be locked for stability.